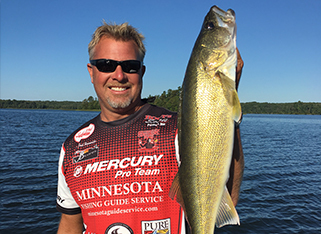 Welcome to Minnesota Fishing Guide Service. Trips Includes: Comfortable Boat, Fresh Bait, Quality Equipment...Everything needed to catch fish! or email Captain Josh here. "Everyone in our party had a great experience on your boat. My 5 year old can't stop talking about the day and the weather. The boat I use is perhaps the most roomy and versatile fishing machine on the market today. The boat is a 21' Lund Pro-Guide powered by reliable 200 h.p. Mercury Verado tiller drive outboard. 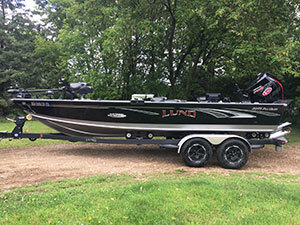 The boat is loaded with all of the latest MN 21 Foot Lund Pro V Fishing Guide Boatequipment such as 2 G.P.S. navigation units loaded with Lakemaster chips, a marine band radio for your safety, a cellular phone to keep in touch, multiple fish locators and graphs, dual trolling motors, and of course--6 swivel air-ride adjustable seats for your comfort. The boat comfortably fishes up to 5 anglers! Everybody that has fished in the boat has loved it!